The Welsh Assembly and the Scottish Parliament have passed a joint plea against a no-deal Brexit, calling for an extension to Article 50. Members in the two parliaments held debates on the same issue at the same time, said to be a first in the 20-year history of devolution. The UK government said the deal was good for the whole of the UK. AMs and MSPs passed motions on Tuesday saying leaving without a deal would be "completely unacceptable" - calling for the withdrawal from the European Union to be delayed and for a no-deal Brexit to be prevented. In a joint statement Welsh and Scottish first ministers Mark Drakeford and Nicola Sturgeon said: "This united and historic step was taken to send the clearest possible message to the UK government and Westminster that this reckless course of action must stop now." Theresa May has promised MPs a vote to delay Article 50 - which will trigger the UK's withdrawal from the EU - if they cannot agree on her deal. Currently the UK is due to exit the EU on 29 March without the prime minister having been able to get her withdraw agreement through Parliament. A further Commons vote on the deal is planned for 12 March. Image caption Mark Drakeford said he hoped the votes would put pressure on the prime minister "to do the right thing". AMs voted 37 for, 13 against, the motion in the assembly. It was supported by Labour and Plaid AMs, as well as Lib Dem education minister Kirsty Williams, but opposed by Tory and UKIP members. MSPs in the Scottish Parliament voted 87 for to 29 against. First minister Mark Drakeford said he hoped the two votes "will put further pressure on the prime minister to do the right thing, to live up to the responsibilities that have been placed in her hands, and to act in a way that defends the interests of families and working people in Scotland and in Wales". He said no deal would be a "catastrophic outcome", accusing the PM of "running down the clock to force a choice between her damaging deal and no deal". "The prime minister says that keeping no deal on the table strengthens her hand in the negotiations," he said. "How she is able to cling to that outdated and failed proposition is a matter of amazement to many, and it is certainly not the case that it is doing us any good now." Jeremy Miles, who speaks on Brexit for the Welsh Government, said a no-deal Brexit risks a "long term undermining of our economy" on a scale "not seen since deindustrialisation". Wales voted to leave in the 2016 referendum. UKIP's Neil Hamilton attacked Theresa May's Brexit deal, saying it was an "insult" to those who believe in parliamentary sovereignty. He said he did not believe that she ever accepted the result of the 2016 referendum. "I don't believe that Theresa May actually ever accepted that decision, any more than the Welsh Government accepts it, any more than the Scottish Government accepts it," he said. "What we've seen in the last two and a half years is a calculated deceit not only to undermine the referendum result but to frustrate it all together". Pro-EU Welsh Conservative AM David Melding said Theresa May's deal is the "best option" of those available, "in that it does... to the maximum extent possible, reflect the 2016 referendum result". "Mrs May's deal is a clear Brexit, in that it ensures the UK leaves the economic and political structures of the EU, ends the jurisdiction of the European court and ends freedom of movement," he said. He said he did not like "any of that" but said the deal honoured the intentions of those who voted leave. Mark Reckless, a Tory group and a former UKIP AM, said: "It's a shame that we don't have more solidarity and unity with the people who Wales, who had a people's vote and voted to leave. "Yet, instead, we see a Welsh Government that purports to represent and govern for them, palling up with the SNP who want to break up the United Kingdom." 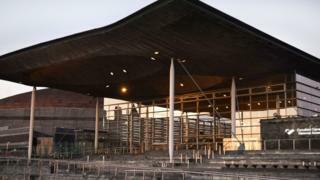 Plaid Cymru had co-signed the main motion in the assembly debate. But Adam Price, Plaid Cymru leader, appealed to Labour AMs to back a further Plaid amendment saying the "best way forward" is for a further referendum, known by supporters as a People's Vote. The amendment failed to pass. AMs have previously passed a motion calling for work to begin on a further poll. Image caption Nicola Sturgeon said Welsh and Scottish governments were brought together by "our dismay, bordering now on despair"
In the Scottish Parliament First Minister Nicola Sturgeon said the Scottish and Welsh governments had been "brought together by our dismay, bordering now on despair, at the UK government's handling of Brexit". She said the Brexit process should be extended "long enough to enable a better path to be taken" - either a compromise exit which would keep the UK in the single market and customs union, or her preference of a second EU referendum. A UK government spokesman said: "An orderly Brexit is in the UK's best interests and the best way to achieve that is for MPs of all parties to support the prime minister's deal. "The deal is a good one for Wales, Scotland and the whole of the UK - it delivers the result of the referendum, gives us a close future partnership with the EU, and guarantees citizens' rights. "Refusing to support the Prime Minister's deal simply makes a damaging 'no deal' more likely."